There was a lot of love for my Starbucks inspired Gingerbread Latte Layer Cake last week. I was totally touched that you’ve all been baking it and enjoying it. Well, I do love a Gingerbread Latte in December, but a Toffee Nut Latte? Now that’s a love affair that could last. So, this week I set about using this flavour combo for some cupcakes. 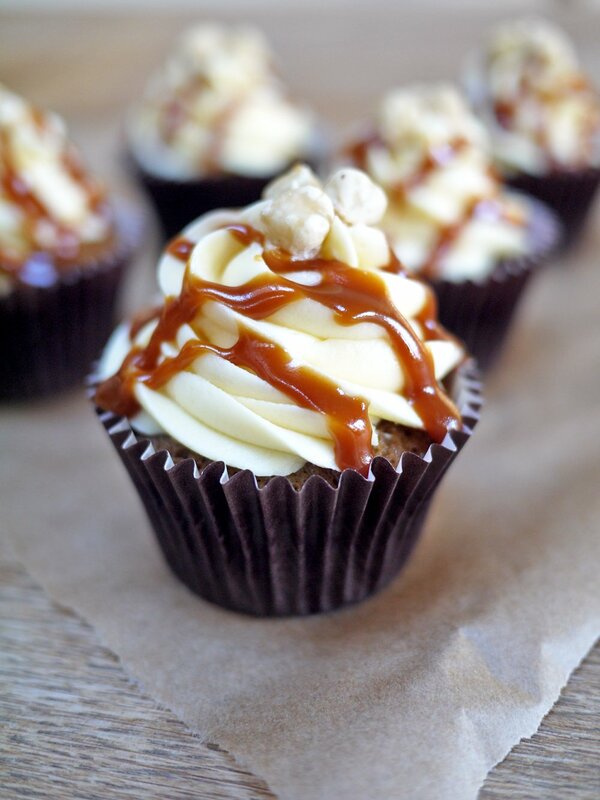 Any recipe that involves a pan of caramel that looks like this has got to be a winner don’t you think? 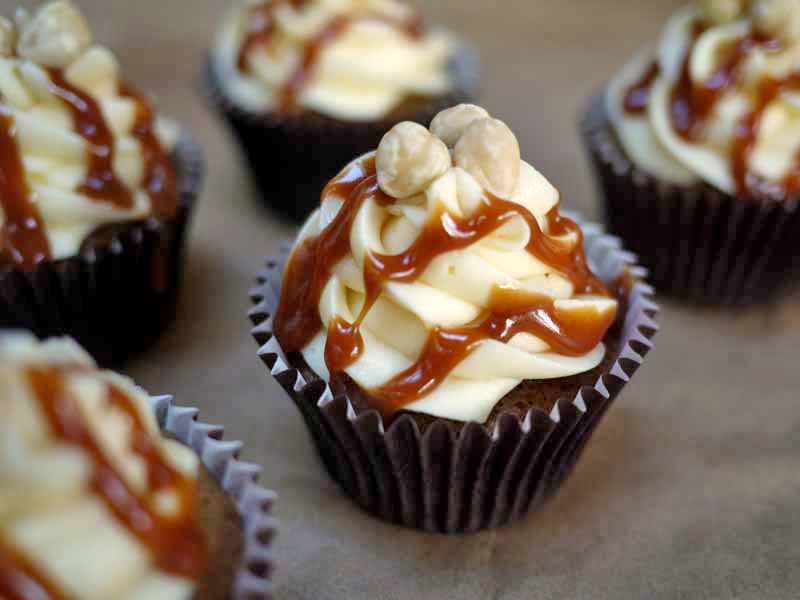 I had an idea to put toffees in the middle of the cupcakes. The first time, I put the toffees in whole (not enough time to faff with chopping toffees) but they sank to the bottom of the cakes. Delicious but not ideal, very sticky. So, on my second go, I cut the toffees up and just popped a quarter of a toffee into the cake batter once I’d put it into the cupcake case. Cutting the toffees up is fiddly, but does add a nice little extra. Do it if you have time (and toffees) but don’t worry if you don’t. 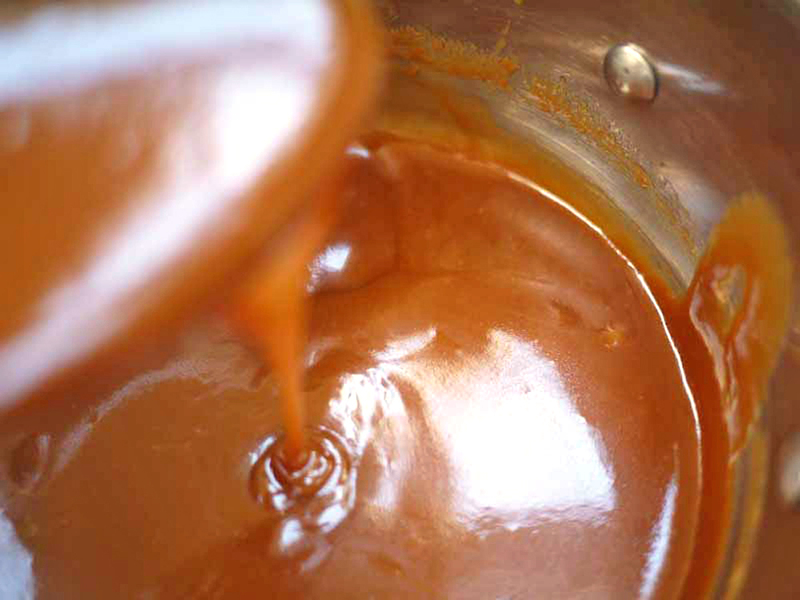 Included below is how to make the toffee caramel drizzle, but you could use some ready made toffee dessert type sauce. 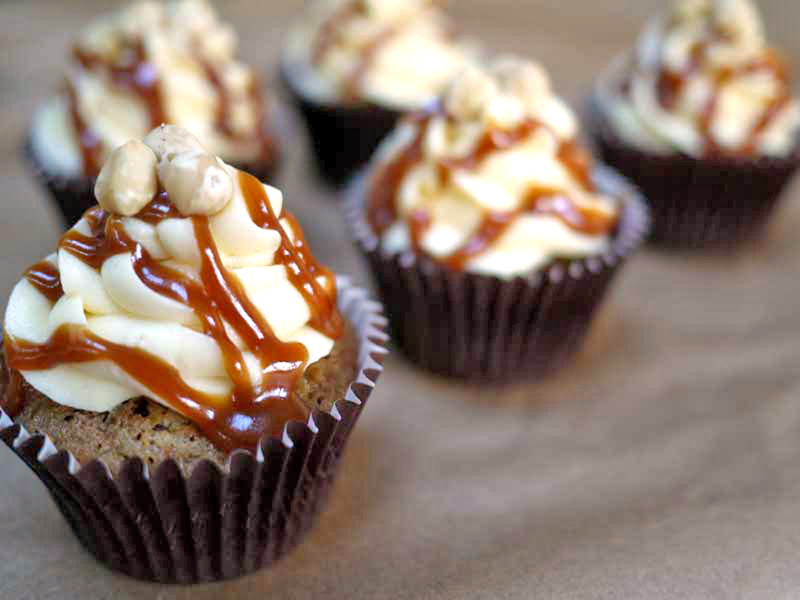 I have to say though, caramel is really satisfying to make and not as scary as some people would have you believe. Just for goodness sake, don’t dip your finger in or lick the spoon, tempting as it is. Geez will you know about it. It gets unbelievably hot. 2. Cream your room temperature butter with your sugar until it’s pale, light and fluffy. 3. Mix in the eggs, one at a time, beating really well after each egg. Don’t worry if it starts to look a bit curdled, it’ll all come good. 4. Mix in your flour. If you’ve been using a mixer, do this bit by hand. It helps to keep the sponge light. 5. Stir in the coffee mixture. Stop stirring before it’s quite combined. I like the slightly swirly effect of the coffee. 6. Spoon into a your cupcake cases in a muffin tin. If you have an ice-cream scoop use that. If you’re popping toffee in, just press a half or a quarter into the middle of each cupcake case of batter. 7. Bake for about 20 minutes or until they are slightly bouncy to the touch. You might need to adjust the time by 2 – 3 minutes either way depending on your oven. 8. Meanwhile make your caramel and icing. 9. 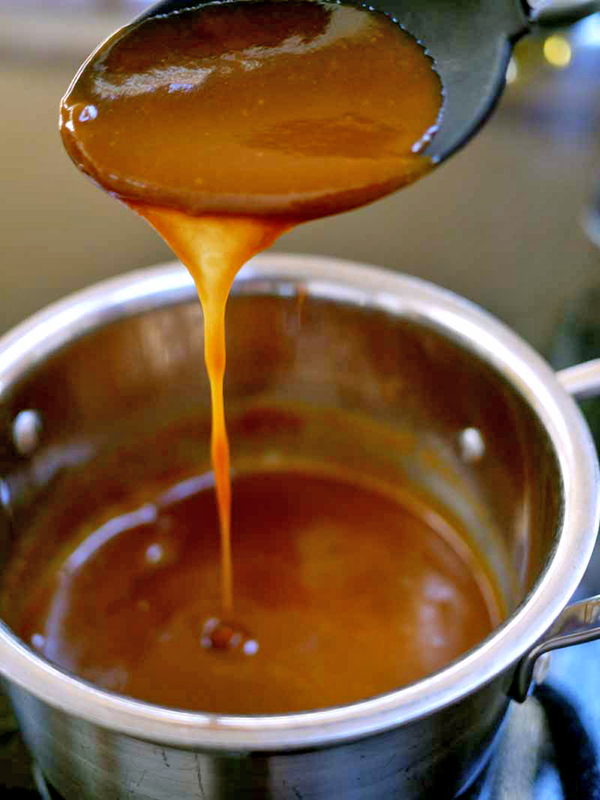 To make your caramel, pop your sugar and butter in a heavy, medium sized saucepan over a low heat. 10. Don’t stir with a spoon, just swirl the pan occasionally to stop anything burning. You’re waiting for the sugar and butter to melt and then turn a toasty golden brown. Watch it like a hawk and take off the heat as soon as it turns a lovely golden brown. 11. Very carefully stir in the cream, beating it in furiously. 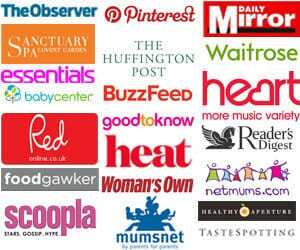 It’ll spit and go a bit mad but will soon calm down. 12. Leave it to go very cold before using. 13. To make your icing, beat your butter until it’s pale, light and fluffy. 10. Beat in your icing sugar and syrup. Beat in a teaspoon or two of boiling water to soften and lighten the texture of the icing. 11. Take your cupcakes out of the oven and when your they are completely cold, pipe on your icing or spread on with a knife. 12. 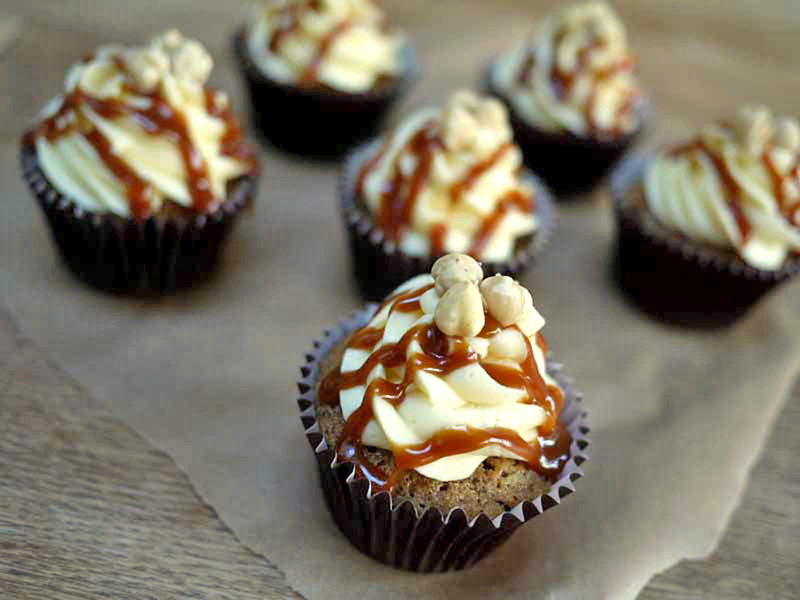 Drizzle your cold caramel in squiggles over the top and then add a couple of hazelnuts for decoration. If you can make these bad boys, put them in the cake tin and not hear them calling your name, you’re a better (wo)man than me..